British Firefighter Challenge 2019 | A competition organized by Firefighters, for Firefighters. The British Firefighter Challenge 2019 will be held in Watford on the 27th & 28th of July 2019. This year’s competition will be bigger than ever with 250 competitors from 16 countries! REGISTRATION FOR 2019 IS NOW CLOSED! The British Firefighter Challenge 2019 is full for competitor registrations. Thank you to all the competitors who have entered. And good luck! Like our Facebook page for news updates about this years venue, accommodation, activities, and training. 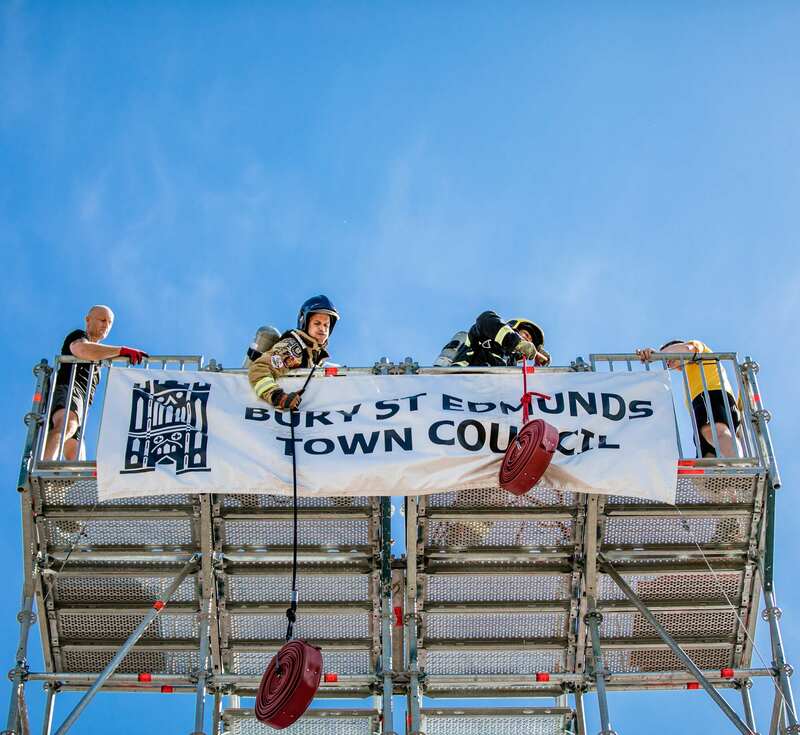 The British Firefighter Challenge is an annual sporting event which pushes firefighters to their limits, provides a day of entertainment for spectators, and raises funds for the Firefighters Charity. Click the image of the challenge below for more information. Competitors will start at the base of the three-story tower, both feet on the ground, competitors may have one or both hands on the hand rails provided prior to the stair climb. On the sounding of the start horn, the competitor will ascend the stairs to the top of the tower. Competitors may climb more than one step at a time on the way up but they must use the external handrail provided at all times within the marked off areas. Once a competitor has reached the top of the tower, they must haul up one length of 70mm delivery hose provided by Angus Fire, this must be hauled over the guard rail provided and then placed into the box provided. Upon placing the hose in the box, the competitor must then descend the tower to the ground floor, whilst descending the stairs, the competitor must step on every single step and have one hand on the external handrail within the marked off areas. Following the stairs, the competitor then proceeds by the marked route to the Forcible Entry Machine built and sponsored by Corhaven. The competitor must have both feet on the platform and using the hammer provided, hit the weight the full distance of the Corhaven machine. The competitor will connect a length of 70mm lay flat delivery hose to a light portable pump delivery (hose and LPP provided by Angus Fire), they will then go to the end of the hose, pick up the branch and drag the hose 60 metres to a marker line, the branch must be dropped over the line to complete this section. Following the hose drag, the competitor will proceed to the hose make up area where one length of 70mm lay flat delivery hose (provided by Angus Fire) will be rolled out on the floor, the competitor must roll up the hose and once completed, carry it to the box provided and place it inside. The hose must be placed fully inside the box. Four foam containers weighing approx 20kg each will be collected from one area and placed in another area a short distance away, the containers must be placed in the marked area provided and not thrown or slid into the area. A 70kg drill dummy (provided by Ruth Lee) must be dragged from it’s location to a finish line, the competition will be completed only when the dummy is completely over the finish line. British Firefighter Open Challenge (hereinafter BFOC) reserves the right to revise the order in which competition categories run the course. Lane assignments are randomized and not subject to change based upon preference or request. Competitors will be assigned a number corresponding with the run order and their course side (odd numbers on the blue side, even numbers on the red side). The next-up competitor must be in the staging area in full turnout gear when the preceding participant is at the start line. Individuals not ready for the start signal will be disqualified. A breathing apparatus for use during the competition will be provided and must be worn by all competitors. Any wilful or malicious destruction of event equipment will result in disqualification from the competition. All competitors must compete in their own protective equipment. PPE (i.e., turnout gear – helmet, jacket, trousers, gloves and boots) must be serviceable (i.e., without holes), approved for structural firefighting consistent with NFPA / CE standards in effect at the time of manufacture. Fire hoods, face shields and earflaps are not required. Articles of turnout gear, SCBA, and all other equipment/worn apparel (including eyewear, radios, etc.) must not be removed or lost during the competition. If dropped, they must be retrieved and correctly replaced by the competitor before continuing. Non-retrieval results in disqualification. Competitors found to be non-compliant either during or after a competition will be disqualified and their time nullified. Questions about the suitability and compliance should be directed the Course Marshal prior to racing. Duct tape or other visible modifications are not permitted. Coats and jackets must be properly sized and cover the area of intended protection. Collars must be showing (not tucked in). Structural boots must have a steel sole/shank and toe (i.e., meet NFPA / CE protection requirements), including a distinct heel breast (of not less than 90° or more than 135° of not less than 1/2 inch or more than 1 inch) and a vapor barrier. Gloves, likewise must be designated for structural fire suppression and bear an NFPA-compliant label. Helmet decorations are allowed, however helmets must have an NFPA-compliant label with the original suspension and padding present. Officials may inspect all gear prior to participation. Their decisions are final. Any competitor who reports to the Staging Area and is found to be in violation of these rules will be subject to a 15-second penalty or disqualification depending upon the severity of the infraction. All competitors are personally responsible for the completion of each task. No course volunteer has the authority to instruct a competitor in the negotiation of the events on the course; only the Course Marshal can intervene or direct the actions of a competitor. In those rare situations where the event staff, or the opposing competitor may have created an impediment, the options to rectify this situation may include a deduction in time to remedy the hindrance or allow another run of the course. All competitors must have completed the course in five minutes or be disqualified where they are, no matter how close to the finish line. The competitor and the Course Marshal will resolve all disputes regarding penalties. We do not review video footage under any circumstances, etc. All Course Marshal decisions are final. Protests must be filed immediately with the Course Marshal, before the next race, prior to leaving the course. 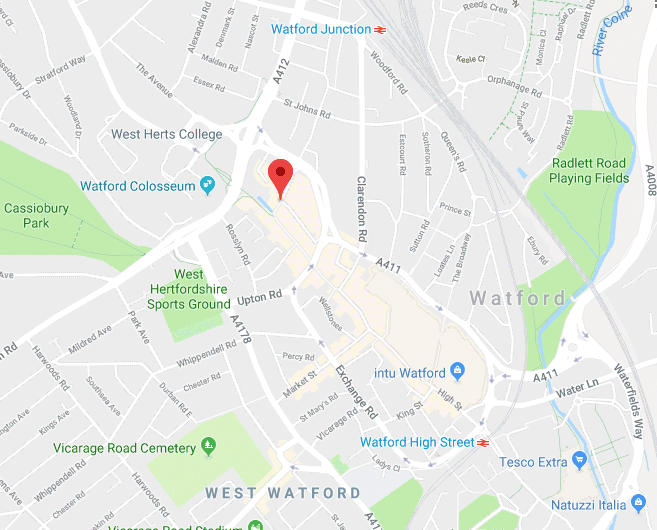 The British Firefighter Challenge 2019 will be hosted by Hertfordshire Fire and Rescue Service in Watford, England. Full Relay Results Coming Soon! Just fill in this short form and a member of the team will be in touch, usually within 5 working days. You will receive a response directly from a member of the British Firefighter Challenge Team. We treat your personal information with the strictest confidentiality and will never share your details with 3rd parties. This website is managed by the British Firefighter Challenge.